Great news! We’ve updated our list of Enemy Pie lesson plans with new ideas for incorporating this story into your classroom writing, friendship studies, and art. Click on the “resources for teachers” tab above to check out the list. And if you have any lesson plans of your own to share, please let me know! Subscribe to our newsletter and enter to win a copy of Enemy Pie! One entry per person. One winner monthly. "We were thrilled with Derek. What a great thing to be a kid and have Mr. Munson visit your school. They will remember this forever! Thanks." 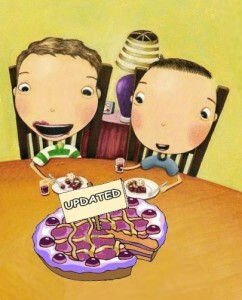 Peggy F.
Enemy Pie Book Giveaway on Laura Candler’s Blog!